With a team of expert bedroom, home office and kitchen fitters in Hornchurch, we guarantee a professional and tidy installation. We understand that everyone’s needs and tastes are different which is why we offer tailored advice and design services. We are a reliable and trusted company however for your peace of mind we have full liability insurance and 10 year workmanship guarantee. At Anscombs we specialise in providing designer kitchens and kitchen services in Hornchurch. We combine innovative designs with fully bespoke and customisable designs to produce the perfect kitchen for you and your family. Visit our kitchen showroom in Hornchurch or click below to find out more or book a free home design visit. Your bedroom is a place to unwind and relax, which is why at Anscombs we supply our customers with a package completely tailored to theirs needs and tastes. From fitted bedroom furniture, dressing rooms and sliding doors to contemporary and classic bedroom designs. Anscombs can design and install your bedroom providing you with the quintessential place to relax. 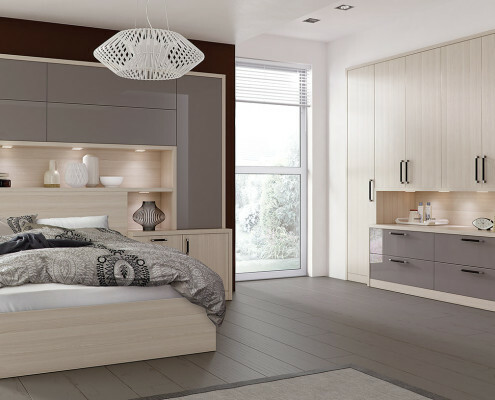 To find out more about our bedroom design and fitting services visit our bedroom showroom in Hornchurch, or to arrange a free home design call us now on 01708 453 029. Each home office or TV media solution Anscombs designs is completely bespoke to maximise the use of space. Visit our home office & TV media showroom in Hornchurch today or to arrange a free home design call us now on 01708 453 029. Why not come and discover our fantastic ranges at our bedroom, home office and kitchen showroom in Hornchurch.